This site # PW162GPL1, is in the Gopalpur Primary School in the Bargoriya village of Swarupnagar Block of North 24 Parganas district. The school authority would appoint a person for the maintenance of the borewell. 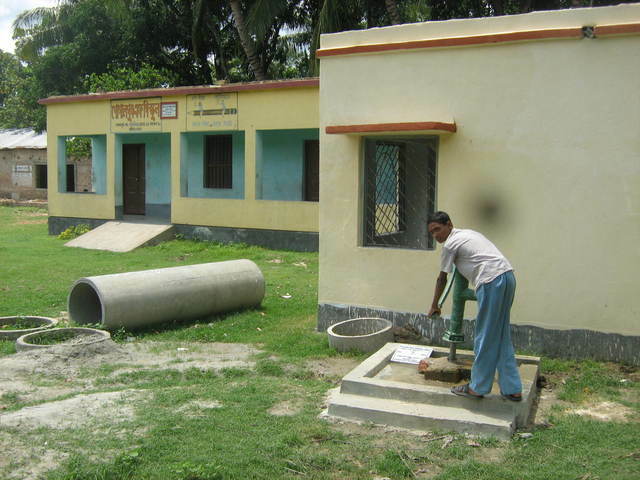 Toilet being constructed within 3 feet from this borewell the only arsenic safe water source for the school students. At the village meeting and meeting with the panchayet members the rules of such dugwells, bore-dugwells and borewells provided by PW-AWS is discussed and one of the rules is that there should not be any toilet or cowshed within 100 feet from the water source. Seeking suggestions, what is the best way to handle the district and village level government officials? 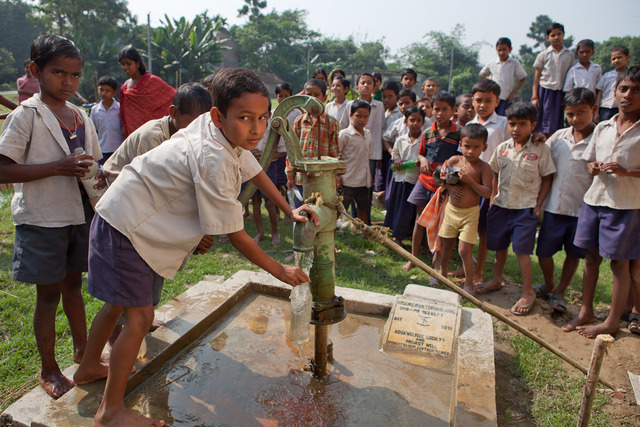 If the educated person(s), headmaster of a government school, does not understand the value of safe drinking water in arsenic zone versus location of a new toilet whom can we educate. Similar incidents happened in the past near dugwell ID numbers PW9, PW24 and PW7 where the panchayet constructed tubewells within 3-8 feet of the dugwells. This leads to not only waste of funds but all the effort of educating the villagers that is being destroyed by the political people. Your expert advice will be very helpful. Thank you. The children were all filling their water bottles and seemed to make frequent use of this well. It was the only water source on the school grounds. While we were there, there was a problem with some of the village leaders coming up and complaining that the well water was unsafe and that the kids should not use the water. Project Well staff was on top of the situation and explained the facts to them that this water was arsenic free, unlike their old well. We drank some of the water and it tasted very good to us. Water Depth 21ft Good Water. 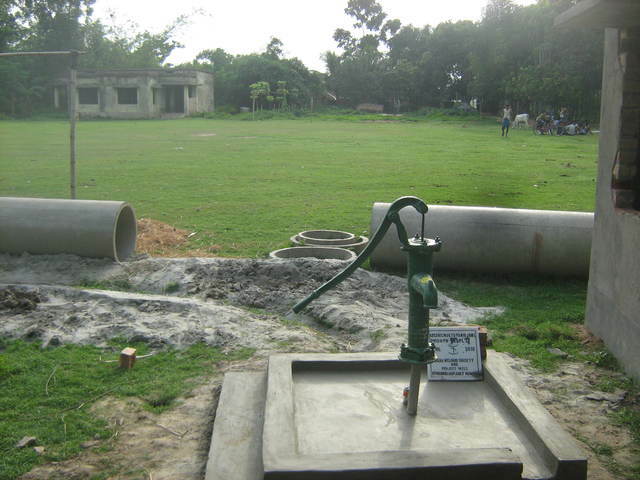 The finishing work of this borewell is almost complete. After completion the water will be tested for arsenic concentration. Theoline will also be applied soon. The school representative will be be trained to apply the disinfectant. According to the register record of July 2011 the total consumers at this primary school is 80-100. Need to get the exact number of students and teachers. 80 to 100 school children are using. Need to get the exact number of students using this source.